The domain within your query sequence starts at position 1071 and ends at position 1149; the E-value for the FYVE domain shown below is 1.42e-24. 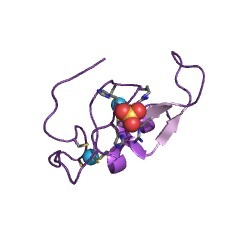 The FYVE zinc finger is named after four proteins where it was first found: Fab1, YOTB/ZK632.12, Vac1, and EEA1. The FYVE finger has been shown to bind two Zn2+ ions. The FYVE finger has eight potential zinc coordinating cysteine positions. The FYVE finger is structurally related to the PHD finger and the RING finger. Many members of this family also include two histidines in a motif R+HHC+XCG, where + represents a charged residue and X any residue. The FYVE finger functions in the membrane recruitment of cytosolic proteins by binding to phosphatidylinositol 3-phosphate (PI3P), which is prominent on endosomes. 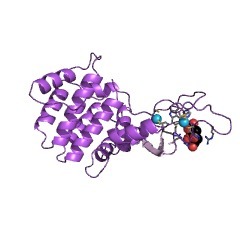 The R+HHC+XCG motif is critical for PI3P binding. 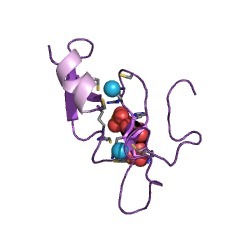 The FYVE zinc finger is named after four proteins that it has been found in: Fab1, YOTB/ZK632.12, Vac1, and EEA1. The FYVE finger has been shown to bind two zinc ions [(PUBMED:8798641)]. The FYVE finger has eight potential zinc coordinating cysteine positions. Many members of this family also include two histidines in a motif R+HHC+XCG, where + represents a charged residue and X any residue. FYVE-type domains are divided into two known classes: FYVE domains that specifically bind to phosphatidylinositol 3-phosphate in lipid bilayers and FYVE-related domains of undetermined function [(PUBMED:15576038)]. Those that bind to phosphatidylinositol 3-phosphate are often found in proteins targeted to lipid membranes that are involved in regulating membrane traffic [(PUBMED:11456498), (PUBMED:11739631), (PUBMED:11509568)]. Most FYVE domains target proteins to endosomes by binding specifically to phosphatidylinositol-3-phosphate at the membrane surface. By contrast, the CARP2 FYVE-like domain is not optimized to bind to phosphoinositides or insert into lipid bilayers. 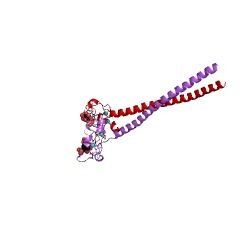 FYVE domains are distinguished from other zinc fingers by three signature sequences: an N-terminal WxxD motif, a basic R(R/K)HHCR patch, and a C-terminal RVC motif. There are 26595 FYVE domains in 25311 proteins in SMART's nrdb database. Taxonomic distribution of proteins containing FYVE domain. This tree includes only several representative species. The complete taxonomic breakdown of all proteins with FYVE domain is also avaliable. Click on the protein counts, or double click on taxonomic names to display all proteins containing FYVE domain in the selected taxonomic class. 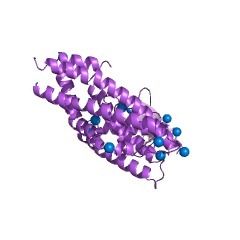 The phosphatidylinositol 3-phosphate-binding FYVE finger. 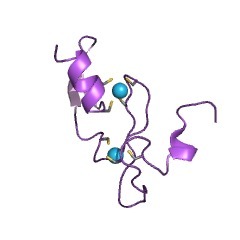 The FYVE zinc finger domain is conserved from yeast (five proteins) to man (27 proteins). 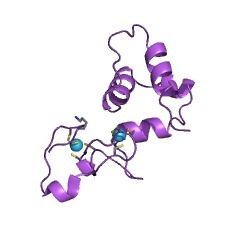 It functions in the membrane recruitment of cytosolic proteins by binding to phosphatidylinositol 3-phosphate (PI3P), which is found mainly on endosomes. Here we review recent work that sheds light on the targeting of FYVE finger proteins to PI3P-containing membranes, and how these proteins serve to regulate multiple cellular functions. EEA1 links PI(3)K function to Rab5 regulation of endosome fusion. GTPases and lipid kinases regulate membrane traffic along the endocytic pathway by mechanisms that are not completely understood. Fusion between early endosomes requires phosphatidylinositol-3-OH kinase (PI(3)K) activity as well as the small GTPase Rab5. Excess Rab5-GTP complex restores endosome fusion when PI(3)K is inhibited. Here we identify the early-endosomal autoantigen EEA1 which binds the PI(3)K product phosphatidylinositol-3-phosphate, as a new Rab5 effector that is required for endosome fusion. The association of EEA1 with the endosomal membrane requires Rab5-GTP and PI(3)K activity, and excess Rab5-GTP stabilizes the membrane association of EEA1 even when PI(3)K is inhibited. The identification of EEA1 as a direct Rab5 effector provides a molecular link between PI(3)K and Rab5, and its restricted distribution to early endosomes indicates that EEA1 may confer directionality to Rab5-dependent endocytic transport. 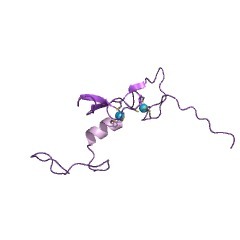 SARA, a FYVE domain protein that recruits Smad2 to the TGFbeta receptor. Smads transmit signals from transmembrane ser/thr kinase receptors to the nucleus. 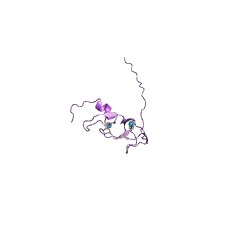 We now identify SARA (for Smad anchor for receptor activation), a FYVE domain protein that interacts directly with Smad2 and Smad3. SARA functions to recruit Smad2 to the TGFbeta receptor by controlling the subcellular localization of Smad2 and by interacting with the TGFbeta receptor complex. Phosphorylation of Smad2 induces dissociation from SARA with concomitant formation of Smad2/Smad4 complexes and nuclear translocation. Furthermore, mutations in SARA that cause mislocalization of Smad2 inhibit TGFbeta-dependent transcriptional responses, indicating that the regulation of Smad localization is important for TGFbeta signaling. These results thus define SARA as a component of the TGFbeta pathway that brings the Smad substrate to the receptor. Endosomal localization of the autoantigen EEA1 is mediated by a zinc-binding FYVE finger. 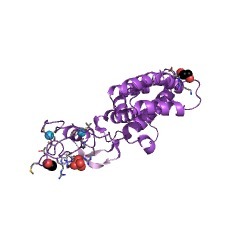 EEA1, a 162-kDa autoantigen associated with subacute cutaneous systemic lupus erythematosus, is a coiled-coil protein localized to early endosomes and cytosol. At its C terminus, the protein contains a cysteine-rich motif, which is shared with Vps27, Fab1, and Vac1, yeast proteins implicated in membrane traffic (Mu, F. T., Callaghan, J. M., Steele-Mortimer, O., Stenmark, H., Parton, R. G., Campbell, P. L., McCluskey, J., Yeo, J. P., Tock, E. P., and Toh, B. H. (1995) J. Biol. Chem. 270, 13503-13511). Here we show that this motif constitutes a genuine zinc binding domain, which we term the FYVE finger (based on the first letters of four proteins containing this motif). Profile-based data base searches identified the FYVE finger in 11 distinct proteins. 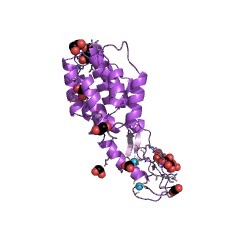 The FYVE finger-containing C terminus of EEA1 was found to bind 2 mol equivalents of Zn2+. Mutations of conserved histidine and cysteine residues in the FYVE motif independently reduced zinc binding to 1 mol equivalent. Confocal immunofluorescence microscopy of transfected HEp2 cells revealed that the C-terminal part (residues 1277-1411) of EEA1 colocalizes extensively with a GTPase-deficient mutant of the early endosomal GTPase Rab5, while deletion of the FYVE finger or mutations that interfere with zinc binding cause a cytosolic localization. These results implicate the FYVE finger in the specific localization of EEA1 to endosomes. 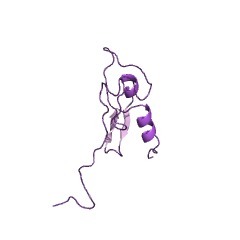 EEA1, an early endosome-associated protein. 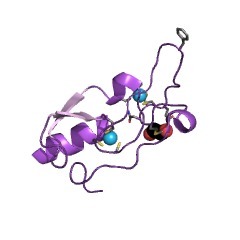 EEA1 is a conserved alpha-helical peripheral membrane protein flanked by cysteine "fingers" and contains a calmodulin-binding IQ motif. Early endosomes are cellular compartments receiving endocytosed material and sorting them for vesicular transport to late endosomes and lysosomes or for recycling to the plasma membrane. We have cloned a human cDNA encoding an evolutionarily conserved 180-kDa protein on early endosomes named EEA1 (Early Endosome Antigen1). EEA1 is associated with early endosomes since it co-localizes by immunofluorescence with the transferrin receptor and with Rab5 but not with Rab7. Immunoelectron microscopy shows that it is associated with tubulovesicular early endosomes containing internalized bovine serum albumin-gold. 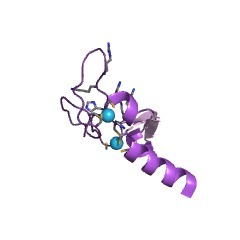 EEA1 is a hydrophilic peripheral membrane protein present in cytosol and membrane fractions. It partitions in the aqueous phase after Triton X-114 solubilization and is extracted from membranes by 0.3 M NaCl. It is a predominantly alpha-helical protein sharing 17-20% sequence identity with the myosins and contains a calmodulin-binding IQ motif. 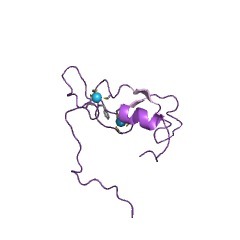 It is flanked by metal-binding, cysteine "finger" motifs. The COOH-terminal fingers, Cys-X2-Cys-X12-Cys-X2-Cys and Cys-X2-Cys-X16-Cys-X2-Cys, are present within a region that is strikingly homologous with Saccharomyces cerevisiae FAB1 protein required for endocytosis and with Caenorhabditis elegans ZK632. These fingers also show limited conservation with S. cerevisiae VAC1, Vps11, and Vps18p proteins implicated in vacuolar transport. We propose that EEA1 is required for vesicular transport of proteins through early endosomes and that its finger motifs are required for this activity. This information is based on mapping of SMART genomic protein database to KEGG orthologous groups. Percentage points are related to the number of proteins with FYVE domain which could be assigned to a KEGG orthologous group, and not all proteins containing FYVE domain. Please note that proteins can be included in multiple pathways, ie. the numbers above will not always add up to 100%.